Curry Cuisine - Cookery Shop and Food Products. 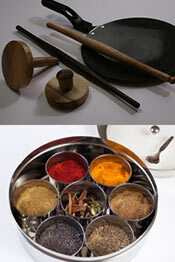 We have a range of speciality Indian cookware and utensils to make cooking Indian dishes easy. You can order these over the phone and pay by card or alternative arrange a delivery/pick up. £3 a jar or any 4 for £10, plus postage and packing.